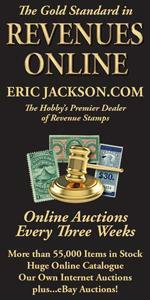 Let’s recall that to be selected for this list of the greatest revenue stamps, a stamp needs to meet one or more of the following criteria: visually stunning; historically significant; interesting philatelic history; recognizable to those outside the hobby. For the sake of interest each article in this series has tried to pick items that are diverse — some old classics and some modern items. The first item is a privately produced provisional narcotic tax stamp that is deserves to be better known. The stamp is the one cent stamp (Scott RJA27) produced by the John Wyeth and Brother firm of Philadelphia in 1919, when the local district collector of Internal Revenue (First District, Pennsylvania) was unable to supply narcotic tax stamps. The details of precisely when this took place have either not been recorded or are lost in records that may or may not exist today. As we shall see the Wyeth frequently canceled the stamps they used with the initials of the fi rm but did not include a date, contrary to government regulations. 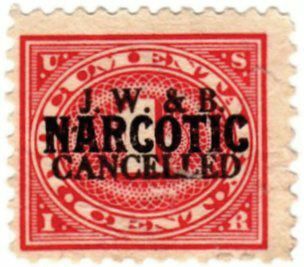 The firm’s two line printed cancel included the firm’s initials, J. W. & B., on the first line and the single word NARCOTIC on the second line. The real reason for understating the rarity is the frequency with which the Bureau provisional with Wyeth printed cancel is mistakenly offered at auction and then at the last minute the lot has to be withdrawn. Curiously lot 651 in the 1980 Kelleher auction, which is the genuine provisional, was not illustrated, whereas, lot 652 (later withdrawn), a Bureau provisional with Wyeth printed cancel, was illustrated! Auction catalogs need to be studied along with prices realized to accurately gauge the rarity of stamps like the Wyeth provisional. To date this author has not been able to document the existence of a second example of RJA27. Our second item is an obscure item that was listed in the revenue stamped paper section of the catalog for many years. The 1970’s were a period during which the modern students were surveying and regenerating interest in the field of stamped paper. The landmark series of articles in the Bureau Specialist by the late Samuel Smith and the follow-up census and handbook by Joseph Einstein, Tom Kingsley and Richard DeKay, which was published by the American Revenue Association, led to the delisting of the blue type A, Scott RN-A4 in the Scott U. S. Specialized. No example of the blue A could be found. This was a surprising development as this stamp was listed by the Trenton, N. J. stamp dealer E. B. Sterling in 1888 and all the subsequent chroniclers of revenue stamped paper up through 1937. The blue A thus was incorporated in the earliest listing in the Scott U. S. Specialized Catalogue. Its rediscovery is a story of the power of information sharing in the Internet age. 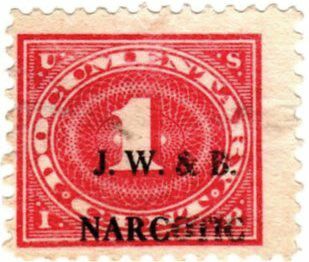 The owner had purchased it from the estate of a small stamp local dealer in Connecticut. When the owner was surfing the net he came across a marvelous summary of what is known about the two cent denominations of revenue stamped paper developed by Robert Hohertz, then of St. Louis (www.rdhinstl.com/rn/rn.htm). To the owner’s surprise a blue type A was neither shown on the website nor was it listed in the current Scott U. S. Specialized. The blue type A (above) was subsequently sold through a private sealed bid auction and is now returned to listing in the Scott Specialized. The instrument on which the blue A is imprinted is an interesting form of receipt. The fi rm of Carter, Kirtland & Co. of New York City had the American Phototype Company print two types of receipts, color coded so that a violet receipt was used for the payment of money and a blue receipt was used for the receipt of payment through a time draft or promissory note. The imprinted stamp was printed at the same time and in the same color as the receipt face itself. It was easy for employees to pick up the correct format receipt since they were color coded. Interestingly, the similar violet receipt with violet type A stamp is also quite elusive and is missing from many collections. Another example of revenue stamped paper that is probably more widely known is the two cent type O, which pictures both the obverse and reverse of a two cent coin. Until recent years this was the most elusive of the two cent types of revenue stamped paper. The design is curious, as it clearly pictures the date of 1874 on the coin, in spite of the fact that the last year that two cent coins were minted for general circulation was 1872 (proofs were also struck the following year, 1873). The design of the type O was produced by the Bureau of Engraving and Printing and was used in only two months by the contract printing fi rm of Morey & Sherwood of Chicago. Until the discovery of a small hoard of checks from Marengo, Iowa, examples of the type O were very elusive, the 1982 American Revenue Association census turned up only 13 complete checks imprinted with this type. Perhaps an additional 4 may have been missed in the census. Given that there were several different recorded users of the type O, collectors often sought an example of each user, further compounding for many collectors the diffi culty of acquisition of a single example. Bill Castenholz chronicled the March, 1996, discovery, published several months later in The American Revenuer. When the dust had fi nally settled, 56 copies from Marengo had been found (Figure 5). The total number of type O’s in collections is now believed to be less than 75. From these nineteenth century stamped paper gems we return to the twentieth century for a fi nal great stamp, the 25 pound potato tax exempt stamp, Scott RI17. 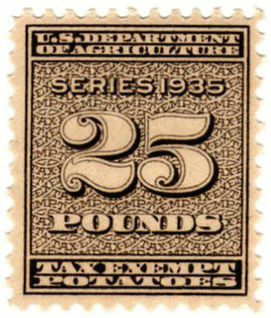 This stamp was authorized under the Warren Potato Act, part of the Agricultural Adjustment Act,one of the programs of the Great Depression that attempted regulate production of certain farm commodities to support the prices received by farmers for their crops. The Agricultural Adjustment Act was tested in the courts and in January, 1936, the means of distributing the tax revenues from the act were declared unconstitutional. Congress subssquently rescinded the law. 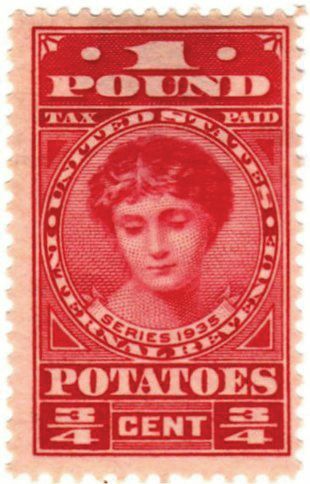 The way the program was supposed to work was to distribute tax exempt stamps to cover the amount of the quota of potatoes that the farmer was permitted to bring to market. The farmer could choose to raise more potatoes, but these were subject to a tax of 3/4¢ per pound. Tax stamps were also issued. The distribution of tax exempt stamps began in Florida in December, 1935. Both the 2 and 50 pound denominations were distributed and used there. In California and Texas, other denominations were distributed, principally the 5 and 10 pound denominations, but apparently the 25 pound denomination was also distributed. Over the last 25 years three panes of 10 of the 25 pound denomination came into collector hands and until 2006 the panes remained intact. Last year one of the panes was broken up so that now 14 collectors can have this great stamp in their collections.